From Quilt in a Day, by Eleanor Burns. 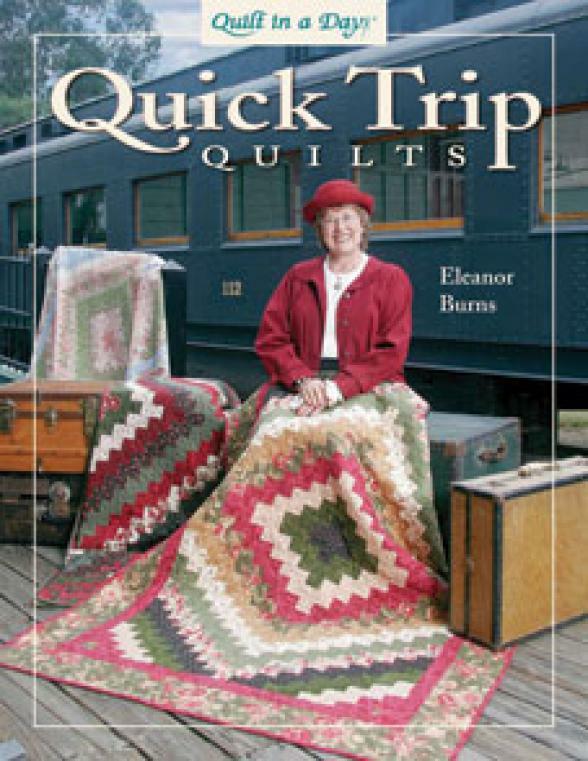 Quick Trip Quilts is a strip pieced pattern with three layouts. The traditional "Quick Trip" is based on a "Trip Around the World" format. A Bargello effect is achieved with the "Quick Quarter" pattern, and for the artist in you, piece a "Water Lily" which adds a bit of applique to a rippling water background. The patterns are easy enough for a beginner but will challenge seasoned quilters to achieve just the perfect effect for an inspiration quilt. Eleanor's technique for this quilt is fun and so easy that it is truly a "Quilt in a Day." Let your personality shine through in your quilt by fabric selection and placement. Yardage and cutting charts are included for all five-quilt sizes with bonus instructions to make table runners from your scraps. The book features sample quilts that symbolize locations from the desert to the sea. Take a trip to your sewing room and create your dream vacation with a Quick Trip Quilt!